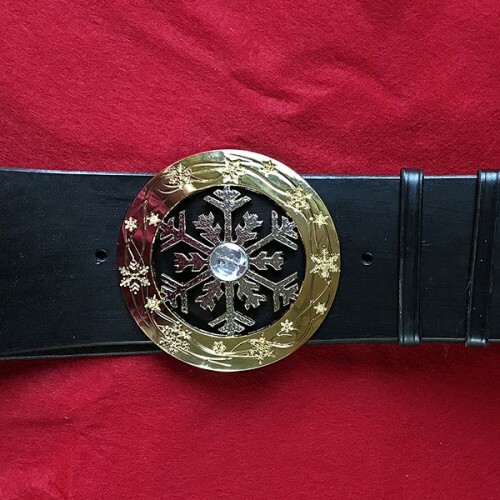 This wonderful 5" wide metal Santa buckle – our Crystal Snowflake Buckle – is the result of over eight months of careful design, planning and execution. 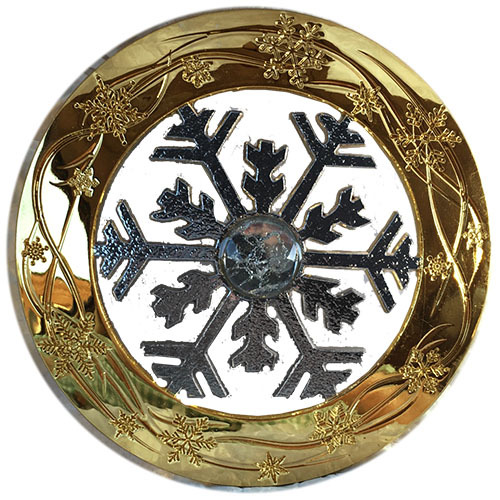 The outside 18k gold-plated ring is 1.3" wide and is engraved with a stylish wind and snowflake pattern. The 3.4" diameter snowflake has a lightly-bump textured for light-play interest and is plated with a shiny, no-tarnish rhodium finish. In the center we have mounted a custom-cut 20mm natural cracked quartz crystal, closely resembling chipped ice. 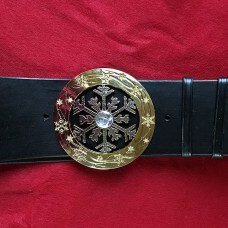 This Santa belt buckle is designed to accommodate a leather belts from 3.5-inches to 4-inches in width, with a ball and post closure, but can take even smaller width belts with only a little show through, or back the buckle with black felt or broadcloth and even tongue and tang closure belts. Inspired by a snow storm at the North Pole, Fabled Santa took that inspiration and crafted a beautiful, flexible function buckle from the highest quality materials and has priced it sharply to provide a value-priced, custom buckle for every Santa. Approx. 5mm thick, this is a durable buckle with heavy plating. Dimensions: 5" in diameter, this buckle is not so heavy as to strain your belt loops, weighing about 10 oz. Designed by the Fabled Santa exclusively for Fabled Santa Industries and custom manufactured for ToysForSanta.com out of quality zinc alloy and plated with precious metals for shine and easy upkeep. We also offer a beautiful matched styling hat pin or brooch.